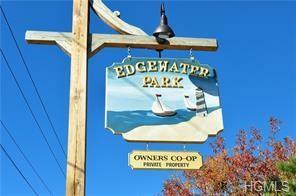 Edgewater Park is a Gated Co Op Community close to the Throggs Neck Bridge. Kitchen and Bathroom are Renovated. Bedroom on the First floor can also be used as a Dinning Room or an Office. Water View from Living Room and Upstairs Master Bedroom. Upstairs has Cathedral Ceilings with Large Windows for a Spectacular Water View. House has many closets and storage space. Parking in front of house and additional parking in parking lot. Enjoy Private Beaches and Boardwalk along the water. Coming soon is a fishing pier. Has a firehouse and community room. also has a children’s playground and basketball court and running track. Low Maintenance $305 and Taxes $120 = $425. 50% is Deductible. Walk to Express Bus and City Bus. Must be Pre Approved by Citibank, Emigrant,Amalgamated or Bank Popular. Must get 3 Personal Letters and 1 Business Letter. Backyard is Big enough for BBQ and Table and Chairs. Family Oriented Community.